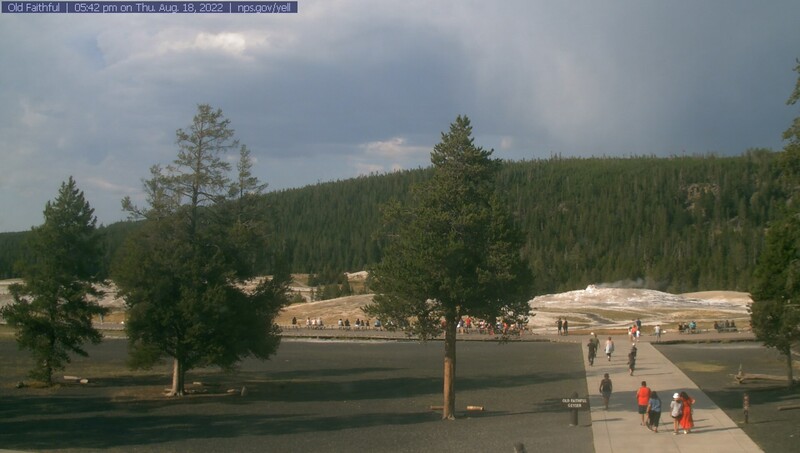 Nine webcams—one live-streaming and eight static—provide views of the current conditions around the North Entrance and Mammoth Hot Springs, Mount Washburn, the West Entrance, and the Upper Geyser Basin. Unfamiliar with the park? Check on the location map to see where each webcam is located. This live view is made possible by the Eyes on Yellowstone program funded by Canon USA, Inc. through a generous grant to Yellowstone Forever. Thanks to volunteers, this webcam provides a streaming view of Old Faithful Geyser and other happenings around the Upper Geyser Basin—one of the most unique and dynamic places on earth, with about 500 active geysers. April 12, 2019: The live-stream webcam move is complete. Thanks everyone for your patience. We hope you enjoy the new views of Old Faithful Geyser, Geyser Hill, and the rest of the Upper Geyser Basin from the top of the Old Faithful Inn. From April 15th through April 18th, scientists will conduct research around Old Faithful Geyser and the Upper Geyser Basin. They are studying the ages of silica sinter deposits and wood samples throughout the basin. Please keep in mind that these scientists have obtained permits from the National Park Service in order to conduct research and travel off-boardwalk in a thermal area. We sometimes experience problems with the webcams. Know that when a webcam goes offline, experiences a disruption in service or image quality, we are working to fix the problem. Learn about hot springs, geysers, mudpots, and fumaroles. Calculate your own prediction for Old Faithful's next eruption. View current conditions at various locations around the park. Images from these webcams refresh roughly every 30 seconds. This webcam is on the park's North Entrance at Gardiner, Montana. It shows current conditions at the entrance with Roosevelt Arch in the background. The arch became known as Roosevelt Arch after President Theodore Roosevelt, who was vacationing in the park, spoke at the ceremony to lay the cornerstone in 1903. The arch is inscribed with a phrase from the legislation establishing Yellowstone National Park: "For the benefit and enjoyment of the people." Morning views from this webcam are spectacular, especially during the winter when the morning sun touches Electric Peak. Look for wildlife—elk, bison, and pronghorn can be seen grazing here. Occasionally you may see the top of oversize vehicles—RVs, tour buses, and delivery trucks—as they stop at the entrance station. Yellowstone is a place of change, and this view highlights a place where change is constant and evident—the travertine terraces of Mammoth Hot Springs. Terraces form when water rises through limestone, which then allows the water to carry high amounts of dissolved calcium carbonate. At the surface, carbon dioxide is released and the calcium carbonate is deposited, forming travertine, the chalky white rock of the terraces. In the foreground are the parade grounds for historic Fort Yellowstone—the focal point of daily life at the fort. Each day began early with a bugler sounding Reveille. Another bugle call brought horse-mounted soldiers trotting onto the field for the flag-raising. Assignments were then announced. Troops either headed out to patrol the Mammoth Hot Spring Terraces and other nearby attractions, or remained at the fort to care for the horses. At dusk, the bugler called all troopers back to the grounds for the lowering of the flag, and the day was concluded with a cannon firing from the top of Capitol Hill. Taps was played as lights winked out and quiet settled over the fort. Construction currently occurring at the fire tower. Construction equipment may occasionally be visible. At 10,243 feet, Mount Washburn towers above Dunraven Pass between Tower Junction and Canyon Village. A fire lookout stationed at the summit provides a popular destination for day hikers, as well as housing for an employee who watches for and tracks fires throughout the summer. This webcam is located inside the living quarters on the top floor and looks out to the northeast. This webcam atop Mount Washburn captures a south-facing view of the north-central part of the park. During summer, the webcam is often re-positioned by the fire lookout, and smoke from wildfires burning in the park may be visible. This webcam is on the West Entrance to the park at West Yellowstone, Montana. It shows current conditions at the entrance gate. This webcam is on the West Entrance to the park at West Yellowstone, Montana. It shows current conditions leading into the park. 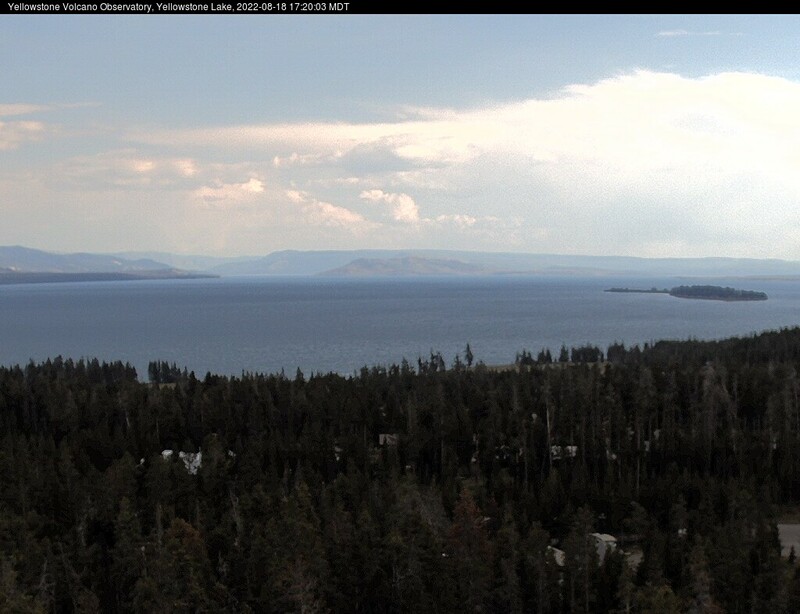 The camera view is south-southeast over Yellowstone Lake from the cell phone tower near Fishing Bridge. Stevenson Island is visible within the lake on the right. The view extends down the Southeast Arm between the Promontory (low ridge rising from the lake) and the eastern shore. Above the shore, the acid-bleached Brimstone Basin remains white even when the snows have melted. The Absaroka Mountains in the background are composed of approximately 50-million-year old volcanic rocks that long precede the current volcanic activity at Yellowstone, which started about 2.2 million years ago. Explore the map to discover the location of all the park's webcams, and learn a little bit more about the cameras. Where is the live-stream webcam located? The live-stream webcam is attached to a lodgepole pine tree near the Haynes Photo Shop at Old Faithful. Why is the lens dirty and why don't you clean it? Wind catches the over-spray from Old Faithful during an eruption and coats the dome housing for the camera with water, silica and dirt. Cleaning the dome on a regular basis in the winter isn't always possible due to freezing temperatures. In the spring, summer and fall, we do our best to clean the lens with available staff. What is causing the camera image to shake or sway from time to time? It looks choppy. The camera is mounted to a lodgepole pine tree. Wind causes the tree to sway back and forth. This movement is most noticeable when the camera is zoomed in to capture a distant image. Why don’t you have a label that pops up to tell us the name of the geyser we’re watching? That functionality is not available on this webcam. Why isn’t the video image sharper? This webcam is HD, but our bandwidth capacity on the available T1 line restricts us to using a resolution of 960x540 at 15 frames per second. The streaming video camera at Old Faithful is a Canon VB-H41. How can the webcam see color at night? The webcam has been set to operate in color mode as long as possible, even into low light conditions. When there is still enough light in the camera's view, even at night, it will continue operating in color view. When the light drops too low, then the infrared cutoff filter automatically engages and the camera switches to black and white night mode. Why do I sometimes get an image that is almost all grey with very little detail? There are a couple possibilities here. On many winter days the steam from the geysers is held near the surface causing a foggy condition that can block the view of the camera completely at times. Sometimes there is a snow storm that makes everything white or grey. Who is controlling the camera? Park staff and volunteers control the camera. Are you planning to install other live-stream webcams around the park? The webcam keeps showing the same picture and time/date stamp over and over. Why? This occurs when the park loses FTP Internet access to upload a picture to our server. Sometime it's a webcam issue when it loses power from a power outage. Try clearing your browser's cache and press the reload (refresh) button. If that does not work, please come back to visit later. Please know that when this incident happens or any webcam goes down, we work quickly to resolve the issue. When I come back to the webcam after being away, it shows an old picture. Why? Your browser didn't update the photo because it was not the active window. When you first come back to a webcam after being away, press the reload (refresh) button to see the latest image. That will get the ball rolling once again. The webcam page loads but there is no picture. Why? If you are getting a gray or black rectangle instead of a picture it could mean that you are not visiting during daylight hours. There are no artificial lights in front of the webcams.